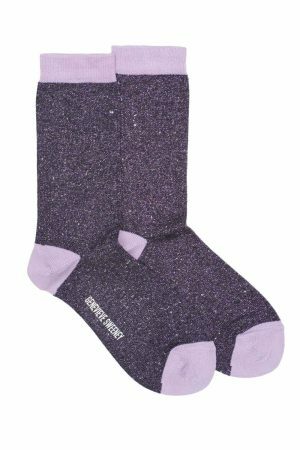 The ultimate lurex party sock, the Selina sparkly grey sock with blue chevron stripe. The traditional intarsia sock has been given a modern update with a chevron stripe that challenges a true hand intarsia sock machine, embracing traditional manufacturing with an innovative twist. A premium blend of cotton viscose with a striking lurex, the Selina Chevron sock combines luxuriously shimmering grey and red colour block with a vibrant blue stripe in a shorter sock length. Finished with ribbed cuffs and seamless toes to ensure ultimate comfort, the Selina Chevron sock brings an unexpected glamorous edge to your favourite part of trainers or sandals with its distinctive attention to detail and high-quality fit.